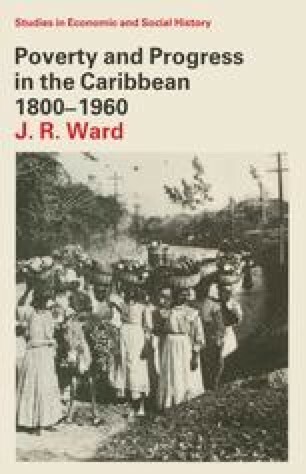 For the years preceding slave emancipation much historical discussion focuses upon the economic difficulties of the British, French, Dutch and Danish colonies in the Caribbean. During the seventeenth and eighteenth centuries they had become largely devoted to sugar planting, and had dominated the market for sugar and its by-products in Europe and North America, but their ascendancy was the result of special and temporary circumstances. Most of the territories were small islands, easily served by ocean shipping, a point of great advantage at a time when overland transport was still relatively unimproved. They also benefited from the restrictive colonial policies of Spain and Portugal, which inhibited the development of potentially much more productive American territories. The colonies of each nation had exclusive access to their metropolitan market where, at least in the case of the British, demand for sugar tended to run ahead of supply, thus inflating its price. Furthermore, surviving producers everywhere stood to gain from the slave rebellion of the 1790s in the French colony of St. Domingue (afterwards Haiti), which eliminated a most formidable rival. Certainly there were times of adversity, most commonly the result of international conflicts. For example, the British islands suffered from the mother country’s military setbacks during the American War of Independence (1776–82), while they profited from her naval ascendancy through most of the Revolutionary and Napoleonic Wars (1791–1815), to some extent at the expense of their neighbours.